Tuesday, June 27: The butterfly outing on Saturday explored the Titcombe bikeway and Tallgrass Prairie Heritage Park. Species observed included Tiger Swallowtail, European Cabbage Butterfly, Summer Azure, Eastern Tailed Blue, Great Spangled Fritillary, Silvery Checkerspot, Baltimore (3), Question Mark, American Painted Lady, Red Admiral, Viceroy, Common Wood Nymph (first reported on the 23rd), Little Wood Satyr (common), Silver-spotted Skipper, Northern Cloudy Wing, Southern Cloudy Wing, Least Skipper, European Skipper, Peck's Skipper, Northern Broken Dash and Tawny-edged Skipper. A Mourning Warbler was singing in Tallgrass Prairie Heritage Park. Watch for Dickcissels! Over two dozen have been found at four locations in southern Kent County over the past week. 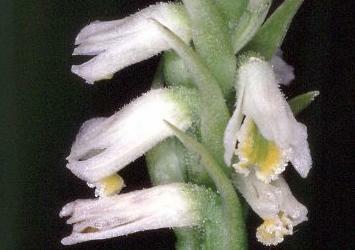 Look for this species in hay pastures, open weedy fields and hedgerows. Friday, June 16: Mayflies have appeared in large numbers over the past few days. Blue-winged Warblers have been reported from Spring Garden Prairie (2 on June 12 by Fred Urie) and Tallgrass Prairie Heritage Park (1 on June 10 by Fred Urie). Two pairs of Blue-winged Warblers are present today in the Ojibway Prairie Provincial Nature Reserve (Russ Jones, Linda Tucker). Other reports from the reserve include record numbers of Baltimore butterflies (17 seen today) and the first blooms of Purple Milkweed Asclepias purpurea and Pale-spike Lobelia Lobelia spicata. Wednesday, June 14: Mid June is a good time to look for several species of orchids at Ojibway such as the Shining Ladies' Tresses (shown above), Purple Twayblde, Fen Twayblade, Tuberculed Orchid and Ragged Fringed Orchid. Visit our new photo gallery on orchids for more information. Friday, June 9: Watch the northern skies over the next two nights. The 11-year peak of the sunspot cycle has arrived and a solar storm on June 6 may produce a display of Northern Lights (Aurora Borealis) over the weekend. New butterflies this week at Ojibway include European Skipper, Peck's Skipper, Tawny-edged Skipper, Buckeye and Baltimore on June 6 (Fred Urie). The showy blooms of foxglove beardtongue, Penstemon digitalis can be seen in the prairie along Matchette Road. Russ Jones reported the first chigger bite of the summer on June 7. Thursday, June 1: Visit our new webpages on insects, mosquitoes & chiggers, and spiders. A few spring migrants are still present at Ojibway. A Yellow-throated Vireo and American Redstart were found near the nature centre this morning (PD Pratt). Fred Urie had two Black-throated green Warblers and a Chestnut-sided Warbler off the Titcombe bikeway and a Tennessee Warbler in Spring Garden Prairie. Yesterday Fred found a Prothonotary Warbler in the southwest corner of Black Oak Heritage Park. The introduced Dame's Rocket Hesperis matronalis which has been in flower for over a week has been attracting good numbers of butterflies such as Silver-spotted Skippers, Spicebush and Giant Swallowtails. New butterflies for the year include Long Dash Skipper and American Snout Butterfly seen today in the nature reserve by Fred Urie. Other plants in flower now include Ohio Spiderwort Tradescantia ohioensis, Canada Anemone Anemone canadensis, Hairy Beardtongue Penstemon hirsutus, Yellow Star Grass Hypoxsis hirsuta and Two-flowered Cynthia Krigia biflora. The first blinking yellow lights of fire flies (Lampyridae) of the summer were noted this evening. Their numbers should increase rapidly over the next week or so. Click here for May 2000 sightings.